It has been a while since I last posted on all things HMRC Digital – but I know my colleagues have been keeping the blog updated with our latest progress on building HMRC digital services that work for everyone and our upcoming apprenticeship scheme - join the biggest digital-revolution in the uk 60 apprenticeships on offer. For the last few months, I have been helping to deliver new tax credits digital services and help colleagues run our annual tax credits renewals event. Today is the last day for renewals and the deadline for customers to renew at midnight tonight is fast approaching. We have made some important improvements this year to encourage take-up and ensure the service is supported by world class resilience. We have worked with users over the last year to make sure their needs are met and the service is simple and easy to use. This year, customers can report any change that may affect their award and see the amount of their next payment. They can also access a range of other services within their personal tax account, such as Marriage Allowance. We have also enhanced the digital service with web-chat for customers who need extra help and reassurance. For customers who want to renew on the move, they can download the HMRC App from the App store and Play Store and complete their renewal in a few simple steps. During the year we have moved our entire Tax Platform over to what's called ‘Active-Active’. My colleague, Tim Britten, blogged in February telling you how the new resilient platform helps us to manage surges in demand as deadline dates for services such as tax credits and Self-Assessment approach. All these improvements have helped us to encourage record numbers of people to renew online. As of last night more than 935,000 customers had renewed online, with a customer satisfaction score of 84%. We are also delivering great service on our telephony channel, with average waiting times well within the target we set ourselves. However, approximately 750,000 customers still need to renew either by our digital service, or over the phone, by midnight tonight or their payments will stop. We are keeping our call centres open until 8pm tonight for those that wish to speak to someone from HMRC. Our digital service is, of course, available 24/7. 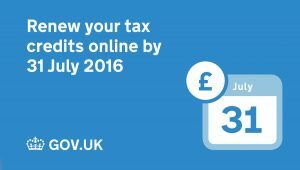 If you are spending time with friends and family today, please encourage them to renew if they receive tax credits. Or you could help the wider digital family by tweeting this post using the Twitter link below to encourage others to get online or phone. Many thanks all and I’ll let you know final numbers later in August!